In the world of gadgets and gizmos, it seems that smaller is better. However, one thing that always works in the opposite way is hard drive storage space. Hard drive makers are always trying to push the boundaries of storage capacity rather than minimizing size. Today, Seagate has announced the GoFlex Desk, the world’s first 3 Terabyte (TB) external hard drive, pushing past the 2TB standard set forth by Western Digital over a year ago. As the press release states, Seagate’s newest model is marketed toward home and office users in order to “meet the explosive worldwide demand for digital content”. As file sizes continue to grow, people demand better quality out of everything. No one is willing to settle for poor quality video and audio in a digital movie when an HD option is just a click away. Likewise, due to higher quality encoding options, music files are approaching 10-15MB. Blu-ray rips of movies can take anywhere from 4 to 40GB, and games that used to take up 600MB can now demand upwards of 25GB for just the basic install. 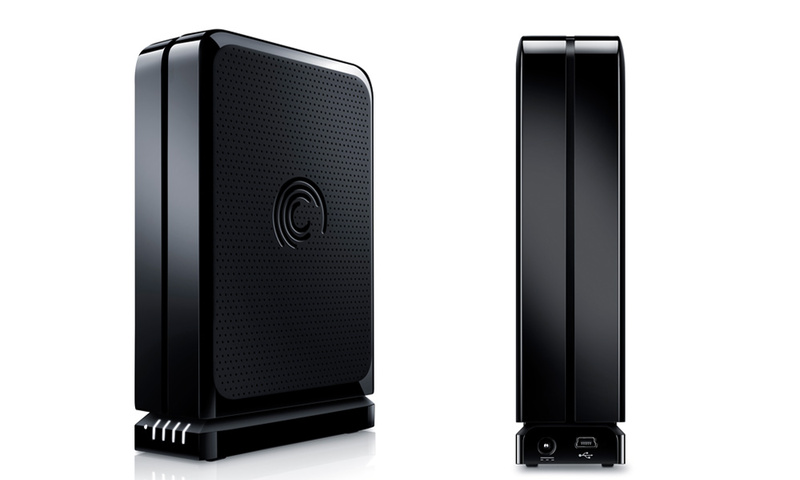 With the launch of Seagate’s newest hard drive, users can fit approximately 120 Blu-ray quality movies, more than 1,000 video games, and nearly one million songs. However, what we should be most excited about isn’t just its storage capacity, but how much the new hard drive is going to retail for–$250. Rewind the clock back to the 2007 and Hitachi announces the world’s first 1TB hard drive. At the time, fitting that many bytes into a hard drive was truly groundbreaking and the product demanded a high price tag. Back then, we were asked to pay $399 for a third of what Seagate is now offering. This is only a testament to how consumer demands are driving the development of new technologies. In a statement made by Dave Mosley, Seagate’s executive VP of sales, he stated, “Consumer capacity demands are quickly out-pacing the needs of business”, which is not only a statement that validates the much lower MSRP but also says something about the target market for the new GoFlex Desk external hard drives. Businesses and their servers are no longer the target markets for huge hard drives; it is now the everyday consumer that Seagate—and many other manufacturers—are making products for. We used to demand 500GBs for millions of documents for the average corporation, but now almost every desktop can be fitted with a 1TB hard drive. With the launch of the GoFlex Desk’s 3TB hard drive capacity and its relatively low MSRP, it’s clear that a terabyte isn’t just enough anymore. Moreover, what’s truly amazing is that it 2TB isn’t even enough for many people. Hard drives are getting bigger and better, and compared to 2007, introductory prices are getting lower and lower. As Mosley said, it is now the consumer that is in demand, and these huge hard drives are made just for you.